“The Deadbeat Apostles are the place where The Grand Ol’ Oprey meets Harlem Apollo” Nightshift Magazine. 6 Oxford messengers with a shared love of sweet sweet music. It was a chance meeting at a ‘Big Star’ documentary at the Ultimate Picture Palace on Cowley road that set off the spark and got their motors running and so the Deadbeats were born in 2016. 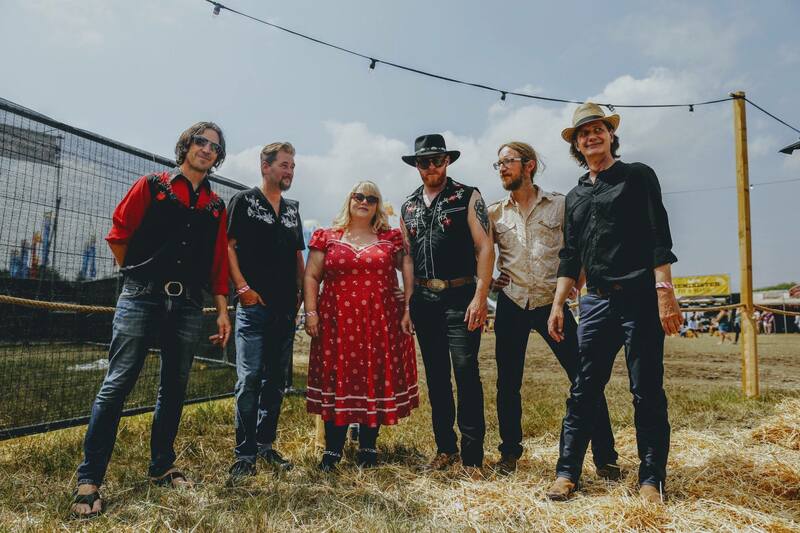 A six piece country soul, blues, rock and roll outfit they set about Oxford with their swagger and sway and haven’t looked back since. Your vocalist is the notorious Mr Michael Ginger who brings to the table a voice described as Wilson Picket, Otis Redding, Percy Sledge and Roger Daltrey all rolled up in to one rampant and gutsy front man – a true original and proper performer who will lay his heart and soul on the stage for you to lap up and take home. Backed up – and sometimes taken over – by Vocalist Ms Michelle Mayes. Described by Nightshift Magazine as ‘the phenomenal Michelle Mayes, a full-on soul belter who should be leading her own revue’ she combines big gutsy screams with a tender and sweet country side. Grinding up behind her a bunch of musicians that get in ya blood and bones and remind you why music is your first love. Guitarist Mr Jake Swinhoe with his unpredictable ever changing rip roaring riffs will keep you on ya toes and gagging to know what is coming next – sometimes even he doesn’t know but it is always pure class. Right beside him is awesome Guitarist Mr Garry Richardson – a steel twang here and a beautiful crying guitar lick there – he will keep suprising you with his talent and trickery. Their totally different stlyes which weave in and out of each other make a truly special team – one review saying “a clutch of rocking intro riffs that would make Keith Richards fall out of his coconut tree with excitement”. Now thats what we wanna hear! What can we say about Bassist Mr Hugh Garrety. Not much that’s printable online – expect the important stuff which is that he is the back bone and heart beat behind the Deadbeats beats. Cooly keeping the music alive he drives a force through the band and keeps us not only on the straight and narrow but also on the bent and wide. His partner in crime and the jewel in the Deadbeats crown is Drummer Mr Alex Ogg. Without him the Deadbeats would be nothing. A collapsed heap of notes not knowing where to run to and what the hell to do. Here lies in these two a rhythm section that is a true gem and so rare to find. 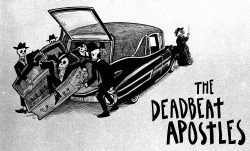 So there ya have em – The Deadbeat Apostles. 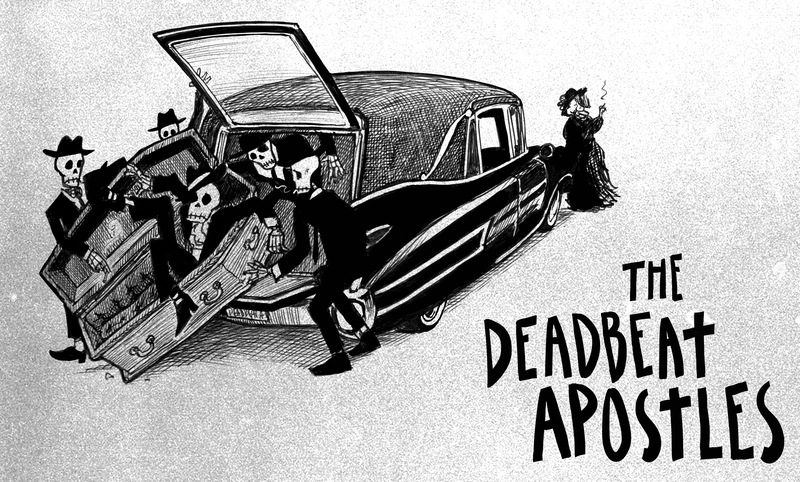 Debut album ‘The Day of the Deadbeats’ out now for your listening pleasure. Some say they crawled out of the swamp land out beyond the bayou, a saviour to the lost souls of a forgotten dream. From the ether they come. They bring hope from desperation, power to the weak, and they burn baby burn in the sweet glory of salvation. But there is no redemption here. Thou shalt not repent or walk a path divine. “Coming up slow from the back lane ain’t got time son” Become the rhythm, feel the beat, let it transport you. “Coming up slow from the back lane ain’t got time son” Closer they come…. count them. One, two, three, four, five, six. Run Devil run. But fear not. For the day of the Deadbeats is coming. And we shall all bear witness to its glory.